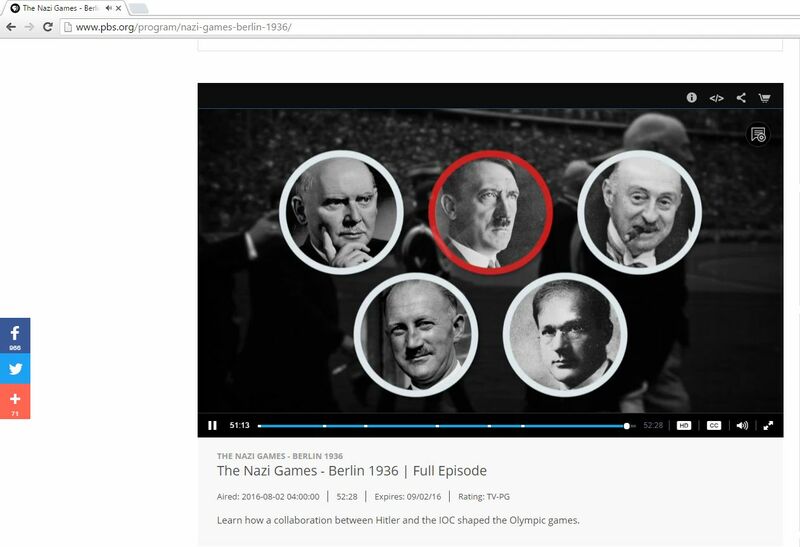 PBS piece places Hiter in center of Olympic ring! 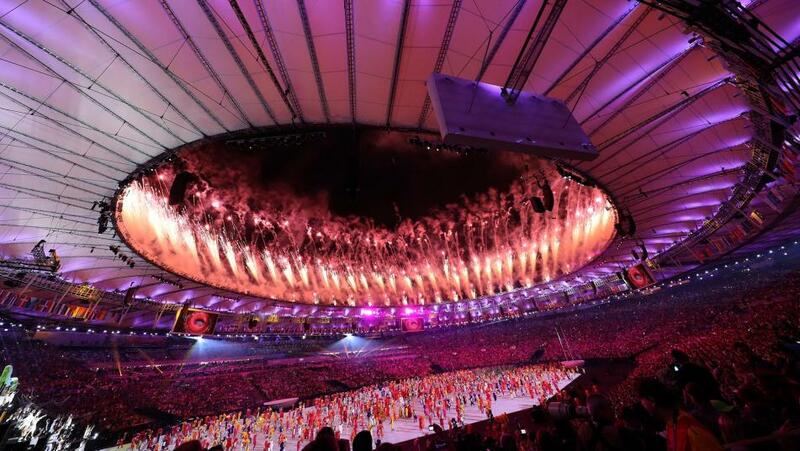 Rio Olympics ended last night to a rousing closing ceremony. It was a Great Success by any and all measures. However the Rio Olympics, as most recent Olympic and World Sporting events from Sochi Olympics to World Cup in Rio, etc. were depicted by Wall Street based Media as pending "Catastrophe" and "Looming Disasters", based on one Fear Mongering and Scare Mongering point after another. A tiny sampling of which Fear Mongering and Scare Mongering is listed below. With these sample articles being a drop in an Ocean of such Fear Mongering and Scare Mongering about Rio Olympic by entire Wall Street based Media in US. Here: The Nazi Games - Berlin 1936 premieres August 2016. "The Nazi Games reveals how the Olympics as we have come to know them were shaped by the collaboration of interests between Hitler and ambitious Olympic gentlemen"
"How the Olympic idea of a perfect Athlete is the same as NAZI ideas of a perfect Athlete..."
"Olympic officials Admired NAZI Hitlers ideals of prompting a perfect Human Body...."
"Achieving your best, as an Athlete, are deep deep roots in both Olympic and NAZI ideas..."
"NAZI Olympics, set the standard for making each Olympic event Bigger and grander..."
"The Olympic Torch run was invented by the NAZI's stays in the Olympic..."
"The modern Olympic was created by the collaboration of Hitler and IOC..."
"Every Modern Olympics has the element of the NAZI Olympic..."
1- Every Sports team wants the best Athlete on their Team, this goes from NFL to UFC to any Football team, etc. 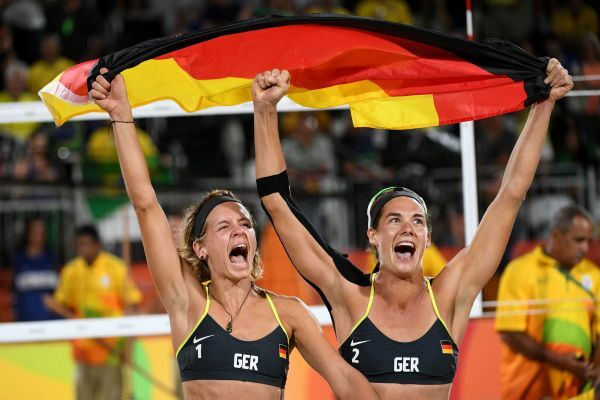 Just because NAZI's wanted these as well as does the IOC as does any Athletic organization, that does not make the Athletes or any Athletic organization such as IOC into NAZIs. Just as NAZIs having liked Beer, or Jet engine or Cars, does not make us today liking Beer, or Jet engines or Cars, into NAZIs. Now why would they do that? To be more exact: Why and Who would come and run a Hit piece about the Olympic 3 days before the start of the Olympic, linking it with the despicable War Mongering ideas of NAZIs, as they ran one Fear Mongering and Scare Mongering stories about the Rio Olympic over the last many Years through out the US Media, a small sampling of which is provided above? Well one could say, that the Olympics, this celebration of Human Spirit and rejoicing in the Human experience, this event that shows that Athletes, that People, from all Religions and Races, whether they are from Islamic Countries or Christian Countries, can come together and cooperate in Peaceful ways, destroys the religious stereotyping that is pouring out of US Media to Fear Monger and Hate Monger based on Religion, such as: "Radical Islam", "Islamic Terrorists", etc., resulting in USA being engaged in War after War after War after War. Or one could say that the Olympics shatter the myth that Israeli's are some sort of "Chosen People" and that they are hard working as depicted by all the same Fear Mongering and Hate Mongering Media in US, given the fact that in each Olympic Israeli Athlete are some of the worse performing, as you can see from Medal Count in 2008, 2012 or current Olympic. "Israel gets same 1 Medal as Afghanistan, which Afghanistan is being bombed Daily"
"Israel gets even less than the 1 Medal that Afghanistan gets!" "Israel is below Qatar in Medal counts"
spirit of friendship, solidarity and fair play. The Military Industrial Complex and the right-wing Media in US, which is the entire US Media, from CBS to CNN to MSNBC to Huntington Post, to the ultra right-wing Media of Fox, TalkRadio, etc. wants to instead foster: Fear, Hate and resulting War after War, resulting in US for example being in Afghan War since astonishingly since 2002, based on Fear of "Islamic Terror", while China the 2nd largest economy in the World that borders Afghanistan, repeat borders Afghanistan, has been engaged in this War for ZERO days, based on fear of "Islamic Terror", which War instead USA that is 10,000 Miles away from Afghanistan has been engaged in since 2002 has spent Trillions of Dollars and 1000s of American soldiers lives lost, lets not even mention the 100s of 1000s of Afghan People's lives lost. Y2K, ISIS, Asian Bird Flu, etc. etc. etc. Unless of course YOU, that is "We the People", say: Enough is Enough to the Fear Mongering, Scare Mongering & Hate Mongering that is pouring out of Wall Street baked Media in US, from CBS to CNN to MSNBC, to CNBS to Fox, to Huntington Post, to Hollywood, etc. and start Boycotting these Mega Wall Street Media Goliath's and instead get our information from Independent sources, such as this realnewspost.org, or any Independent News organization you want, but not from the Fear Mongering, Scare Mongering & Hate Mongering that is pouring out of Wall Street baked Media. 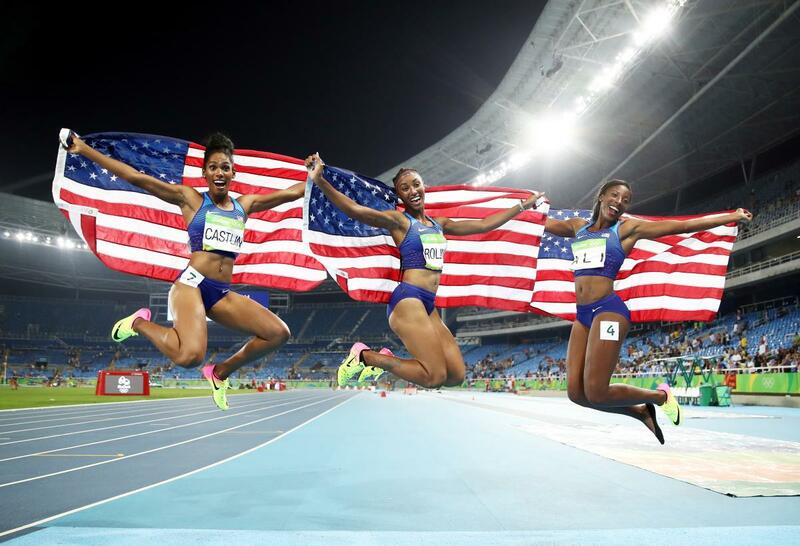 As the last Word, I cannot wait until the 2020 Olympic in Tokyo, because the Olympic Spirit of Peace through Sports for a better World, is Stronger in all of US than all the Fear & Hate pouring out of Wall Street baked Media. Man this article should be read by any thinking person to see what a right-wing lying Media entire US Media are. You want more Traffic to your New Site, then genuinely discuss the News here. And if People like what you are saying then they will click to your Profile from where they can click to your News Site. What an Eye Opener of an article. Wonder how much coverage this article that shows the Fear Mongering, Scare Mongering & Hate Mongering by Big Media in US will get play time on Big Media in US? I am sure not. What I specially like is how you have shown Huffington Post to be a part and parcel of the right-wing Hate Mongering for many People are under the illusion that this piece of garbage of online publication is a Liberal Media where as per their Hate Mongering about Rio to War Mongering about Libya, Syria, etc. they are anything but that. Excellent article. I Specially like your analysis how these negative reporting about suit the Israel agenda, since Israel does very bad, well nothing, in Olympic. Showing that exactly as you noted they are far from this "invincible" worrier that same Big Media in US behind Scare Mongering behind Olympic events has been selling to the World. My hat off to you to exposing this fact with charts and data. It is great to know that there are People like you in USA, and not just the raving lunatics made so by all the Fear & Scare Mongering of Big Media in US. As for me, I shall Boycott all US based Big Media outlets and shall hope my family will do same. Yes, indeed. What happened to all that "Rio is a pending Disaster..." that US media was running? It is really Fox but profusely pro Gay. Yes, what happened to Rio is going to be a "Big Catastrophe " and all other predictions of Doom & Gloom?